Mike Gunn is the iconic king of dry comedy. Mike Gunn is one of the top 10 comedians in Britain today – Independent on Sunday. He is a headliner at all of the major comedy clubs today in the UK and abroad. 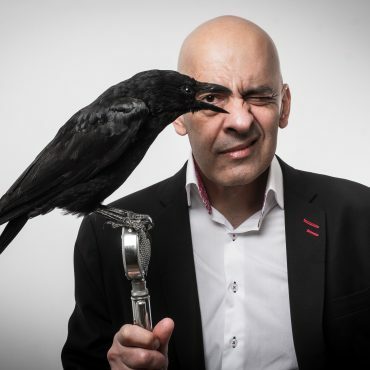 He has taken two shows to the iconic Edinburgh Fringe Festival, with the first being a show based on his alter ego as a Funeral Director titled ‘ Good Grief’ which he received critical acclaim for. This was followed up with ‘Uncut’ a show looking at recovery of drug addiction. Mike is also a top choice of act for corporate events. His stone cold delivery has been described as 'drier than a dead man's bones', but you can rest assured the audience will be roaring with laughter. Early on in his career Mike supported the likes of Alan Davies & Jo Brand. He has also embarked on a successful 35 date tour with friend and comedian Sean Collins. Gunn’s writing credits include The 11 O Clock Show & Match of The Day Magazine – even though he hates football! More recently Mike supported Lee Mack on his UK tour. The Comedy Club’s service was very good and Mike was fantastic; he had us in stitches from start to finish and responded to our brief with a superbly tailored performance. Lots of people came up afterwards to say how much they enjoyed it, which after a long day at conference made this a highly enjoyable and memorable event - Mike was the perfect finale. The Comedy Club provided an excellent comedian whose tailored performance received very good feedback from all members of the audience - It was a very conservative crowd so i’m very pleased Mike rained in certain parts of his act for the sake of the night, but I would still love to see him let loose one day! We raised a fantastic amount of money and your service was very good. The Comedy Club called for background research and the comedian provided, Mike Gunn was very personable on the night, a very nice guy. Mike Gunn was very good and funny, an excellent service was provided. He controlled the audience in a funny manner. Thanks again. I agree there was a lot of scope for Mike to create "actionable incidents" but I thought Mike got just the right balance and was actually very funny. Really was an excellent night. Mike went down really well and the feedback has been nice.. it was very well received.